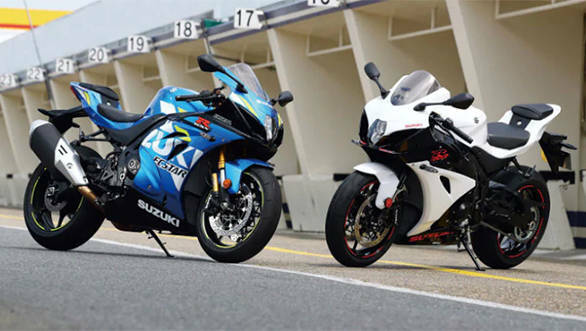 In more new which shows the massive scale of the Indian two-wheeler market, Suzuki Motorcycle India today announced that it has produced over 40 lakh motorcycles at its factory in Gurugram, India. This milestone has been reached in 12 years, given that the company started operations in 2006. This is also an important step in reaching the motorcycle maker's target of selling over ten lakh bikes a year and doubling its market share by 2020. The Japanese manufacturer currently sells 17 motorcycles in India which includes everything from commuters to big performance motorcycles. Its scooter line-up includes the Access 125/SE, the Burgman Street and the Let's. It also sells numerous variations of the Gixxer and Intruder motorcycles and well as the Hayate. Its big bike range consists of the V-Strom 650 XT, V-Strom 1000, the GSX-S750, the GSX-S1000, the GSX-R1000R and the Hayabusa. It also sells the off-road only RM and DR series of dirt bikes. The company is present in India via 521 dealerships. Speaking of this achievement, Satoshi Uchida, Suzuki Motorcycle India's managing director said, "We are delighted to roll out the four millionth vehicle and are thankful to our customers who have shown immense trust in our products. This is a testimony of our commitment to India and we wish to achieve many such milestones in the future. With this landmark, we are a step closer to achieving our sales target of 7.5 lakh units by the end of the current financial year. We thank our valued customers, business partners, associates, and all my colleagues for this remarkable feat."